Nowadays, with the help of cloud-based, software-as-a-service (SaaS) enterprise software tools, it has become easier to start up a new venture — the tools are relatively inexpensive, easy to use and are designed to connect people, making it easier for teams that work together. For example, Slack's team messaging tool, HighFive's video conferencing tool and Trello's project organization tool, each make collaboration more feasible. But that doesn’t mean it’s all simple. While these tools may have helped your company improve collaboration, using a separate tool for each task can feel disjointed. How many times have you felt that one software tool is disconnected from the rest? Have you gotten tired of logging into each separate one? Have you had trouble remembering which software tool does what task? No matter how organized or helpful a startup’s enterprise tool is, if other software tools you are using alongside it seem disconnected from the rest, you might not be working as efficiently as you can. There is a way to solve the problem. What if you connected everything on one platform? What if you had one easy-to-use set of tools that had similar operations in each application? What if your collaboration tools were built into the tools you used to perform actual work, like creating documents, tracking projects and providing status updates? At ServiceRocket, we use the Atlassian suite to facilitate global collaboration, organization, deployment and management. Though our offices are stationed in various parts of the world, the Atlassian suite allows us to witness the development of projects, assignments and ideas of any Rocketeer from any point on the globe. For example, while I worked on this blog post, I received feedback from Daniel Bergamin — one of our senior technical consultants — who works in our Sydney office. He saw my work in progress on Confluence, and while he isn't involved with content development, he figured his knowledge could help better develop my own assignment. By sharing his knowledge via comments, he's defining team collaboration. Such collaboration on one interface has certainly allowed ServiceRocket to achieve success on multiple occasions, and moreover, has helped us "Share the Knowledge" and "Think Team" — two of our company values. We use other tools, like HipChat, to further our values. While HipChat is a fun place for us to bond as a team and share our company culture, it's also a great collaboration program a part of the Atlassian suite. Enterprise software tools like Slack have similar functions, but face challenges. Slack’s enterprise collaboration tool is renowned for offering internal teams an organized chat space, and while its integration feature allows for external sources to be used as plugins (such as Google Hangouts), Slack isn’t a part of an overall suite aimed to best organize communication, collaboration and actual work. Because HipChat, on the other hand, is a part of the Atlassian suite, it is attached to applications like Confluence, JIRA, Stash, Bamboo, etc. Our teams can communicate via HipChat whilst simultaneously using all other Atlassian products. HipChat for JIRA, for example, is an integration tool available for companies to collaborate faster, from anywhere, to solve any issues. The integration allows one-click linking of JIRA projects and HipChat rooms, HipChat to include more details of an issue whenever it is mentioned and JIRA issues to create HipChat rooms. So there really is no reason to use multiple, separate tools when one program can work efficiently alongside others. And while tools are important, that's not the only thing that defines collaboration. Without a culture of sharing and collaboration, no tool will ever be collaborative. So, what makes your organization “collaborative”? Creating a supportive environment, having influential “pro-collaborative” leaders and integrating team-thinking into workflow can all define your organization as “collaborative.” It is still important to use collaborative tools and strategies to empower an existing culture of collaboration, but if the tools you’re using aren’t consistent with your team culture and goals, then what’s the point? Here's the point: Aim for collaborative tools, synced with your culture. 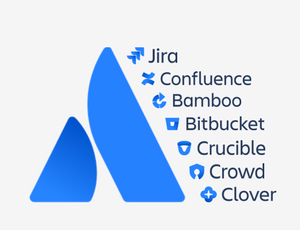 The Atlassian Suite is the epitome of this — multiple collaborative tools that are connected, organized and backed by the same system. With the Atlassian suite and team organization products like JIRA, Confluence, HipChat, your company is sure to embody the meaning of collaboration. What tools are you using for internal team collaboration? How do you feel about using separate tools for your company?